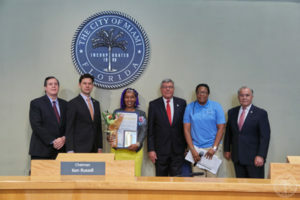 City of Miami Mayor Francis Suarez and the City of Miami Commissioners presented Jamarah Amani, community midwife and organizer, whose work narrative is dedicated to the importance of midwifery and doula care being accessible to help reduce health disparities. Amani ’s mission is to do her part to build a movement for Birth Justice locally, nationally and globally. Her work has a lens toward those who are most marginalized for various reasons related to the oppressive forces of our society. A community organizer from the age of sixteen, Jamarah has worked with several organizations across the United States, the Caribbean and in Africa on various public health issues, including HIV prevention, infant mortality risk reduction, access to emergency contraception and access to midwifery care. She is currently the director of Southern Birth Justice Network, a 501(c)3 non- profit organization. Jamarah studied Africana Studies, Women’s Studies and Midwifery at centers of learning such as University of Pennsylvania, Clark Atlanta University and, most recently, International School of Midwifery. Jamarah is also a Certified Lactation Consultant. 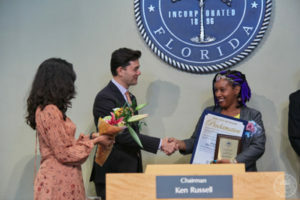 In addition to raising four lively children (who are also raising her), Jamarah offers midwifery care, breastfeeding consultations and childbirth education to families and communities across the state of Florida.